The Piano Trio No. 4 in E minor, Op. 90, B. 166, (also called Dumky trio from the subtitle Dumky) is a composition by Antonín Dvořák for piano, violin and cello. It is among the composer's best-known works. At the same time it is a prominent example for a piece of chamber music deviating strongly from the customary form of classical chamber music – both in terms of the number of movements and of their formal construction. 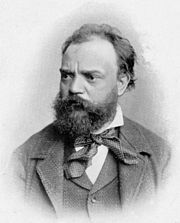 Dvořák completed the trio on 12 February 1891. It premiered in Prague on 11 April 1891, with violinist Ferdinand Lachner, cellist Hanuš Wihan, and Dvořák himself on piano. The same evening, Prague's Charles University awarded the composer an honorary doctorate. The work was so well received that Dvořák performed it on his forty-concert farewell tour throughout Moravia and Bohemia, just before he left for the United States to head the National Conservatory of Music of America in New York City. The trio was published while Dvořák was in America and was proofread by his friend Johannes Brahms. The composition features six dumky episodes throughout. The initial three dumky are connected together without interruption in the harmonically complementary keys given above, in effect forming a long first movement. The final three dumky are presented in unrelated keys, thus giving the overall impression of a four-movement structure. Musicologists Derek Katz and Michael Beckerman observe, "Whereas in the quintet [Op. 81] he had borrowed a plan from Schumann to mold his dumka into a quasi-traditional framework, here he allows each of the six dumky to stand fully realized on its own." ^ a b Keller, James. Chamber Music: A Listener's Guide. New York: Oxford University Press, 2011. ^ Way, Joseph. "Antonin Dvorák (1841–1904)". Sierra Chamber Society Program Notes. Archived from the original on 2006-10-14. ^ Ulrich, Homer (1966). Chamber Music, 2nd Edition. Columbia University Press. ^ Felsenfeld, Daniel (2006). "Dvořák Chamber Music". In Dvořák Trios (p. 4) [CD booklet]. New York: Koch Records. ^ Katz, Derek and Beckerman, Michael (2004). "The Chamber Music of Smetana and Dvořák." In Nineteenth Century Chamber Music, Stephen Hefling, ed. New York: Routledge Press, 2004. 341. This is a video (audio) by YouTube of a live performance, where all six movements of the piece are being performed in San Francisco 2008 by the Beaux Arts Trio. This page was last edited on 9 April 2019, at 08:57 (UTC).